Probably not just one of my favourite designers, but THE designer. Definitely someone who has inspired me in so many ways, Asia Pietrzyk, not just extremely talented, she’s one amazing person. I seriously had butterflies in my stomach when i sent her the guest post email, but she was such a delight. 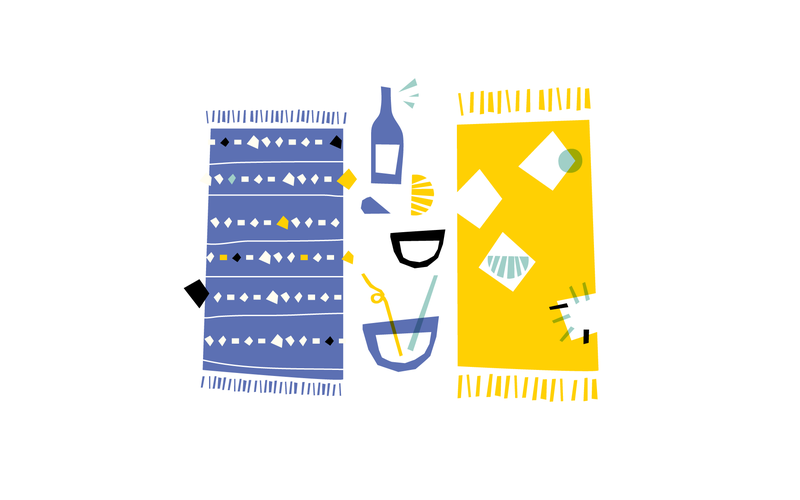 Now, ain’t that summer graphic really something? Hi to all of you wonderful people! Hope you are doing wonderful, i truly have missed you so much! I’m home, taking some time off, and squeezing in some work at the same time. I seriously can’t wait to be back, spending my days at the beach, have filled me in with so much creativity! I’m stepping by today for a wonderful occasion! My lovely girl Miranti is celebrating her 31st birthday, and together with some pretty awesome bloggers, we’re giving away a wacom tablet! I don’t know how i would live without my tablet. Trust me, it’s something you need! Hi there, Cocorrina readers! I’m Jessica over from Coco & Mingo and so excited to be taking over today while Corina is off on vacation! I can’t wait for her to come back with awesome stories and photos. 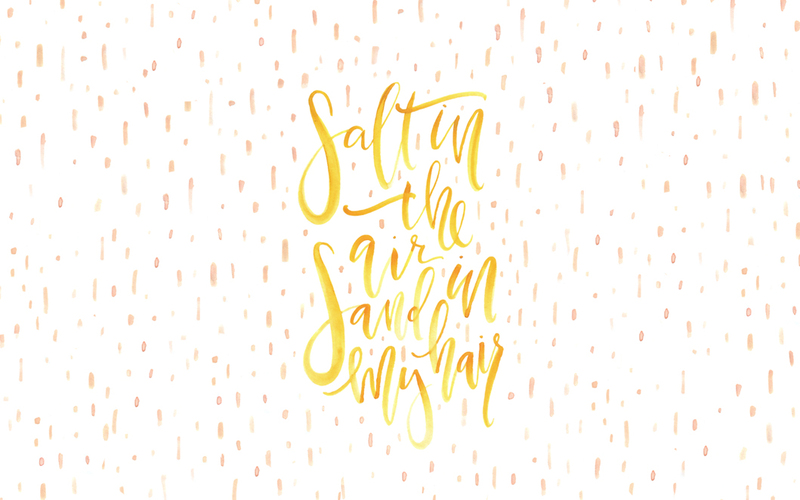 In the meantime, because it’s summer and everyone is taking advantage of the weather and preparing BBQ’s and gatherings with friends and family, I thought that I’d share a little invite printable that you can send out if you happen to be hosting a fun summer gathering! Printable created by Coco & Mingo for Cocorrina. For personal use only, not for distribution or resale. In March we hit the road with our husbands for a trip to the west. We all have a deep love for travel, so the idea of being on the road where you can stop at as many destinations as possible is our *ideal kinda trip! From brunches by the Cali coast, to late nights in Vegas, all the way to the magnificent Grand Canyon, we crammed in as much adventure as we could manage in a week and a half! Since we’re both photographers, you can imagine the hundreds upon hundreds of photos we ended up with. But our favorite stop that we wanted to share with you was Valley of Fire in Arizona. We heard of this breathtaking location, of course, through browsing Pinterest for beautiful scenery, and once we saw it was in AZ, we knew we had to see it! The winding road is so mesmerizing, and the moments in the car were spent with us girls snapping as many photos as possible and the boys silently taking it all in. We made a few stops where we abandoned the car and ran off to find adventure. We climbed rocks and got beaten by the wind and sand. Our faces lit up as we soaked up all the beauty that Valley of Fire had to offer. Renee here from Will Frolic for Food! I hope you all are enjoying some lovely Summer sun, wherever you are. Summer makes me crave fruit (and coconut water). I could eat it for every meal, practically (who am I kidding, a girl needs toast). During the Winter I really don’t give a damn about fruits. But I’m eating boatloads of apricots, peaches, blueberries, blackberries — if I can find them — and as many rasperries as I can get my hands on. I know, I know — I’m preaching to the choir here. EVERYONE digs fruit in the Summer. So, this cocktail. Well, technically, it’s a “cocktail-like” drink as there’s no hard alcohol involved. Mimosa’s fall under the same category. This one’s pretty simple — simple enough that I can claim to have invented the recipe, and I’m nothing like a professional mixologist. Which means it’ll be easy for you to make — less headaches, more booze. Done and done. Halve kiwis and scoop out the fruit (as you would an egg). Mix coconut sugar and hot water to create a syrup. In a blender, combine kiwi, coconut sugar syrup, champagne, and ice cubes (I used two, but use as many as you like). Pour into champagne glasses and garnish with kiwi slices. Serve immediately. Hello Cocorrina readers! 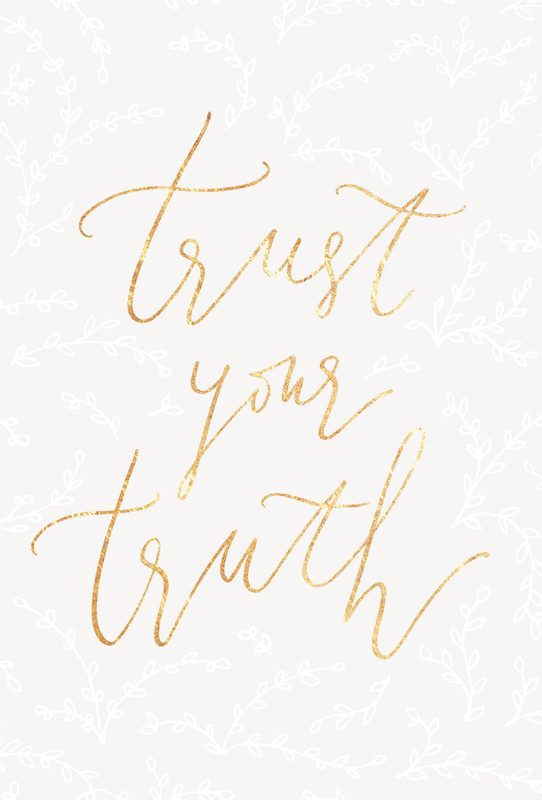 This is Maggie from type & title and I am very excited to be here guest posting today with a downloadable calligraphy wallpaper for you! Lately I have really been into setting a mantra for my workday. By choosing a statement or intention for the day (or week, or month) I have a positive thought to fall back on in case I feel doubtful, lose my motivation or need a push in productivity. 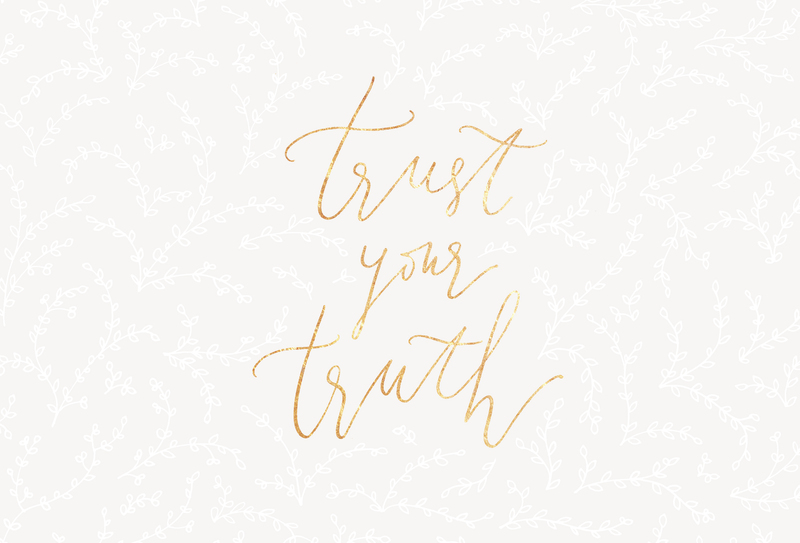 Today I am sharing one of my recent mantras with you… trust your truth. It’s so easy to get caught up in what everyone else is doing. Especially with all the time we spend on Instagram and Pinterest and Facebook. I love social media and have no desire to stop using it but I have to admit it can sometimes be hard not to compare your own work or life to what others are presenting to the world! 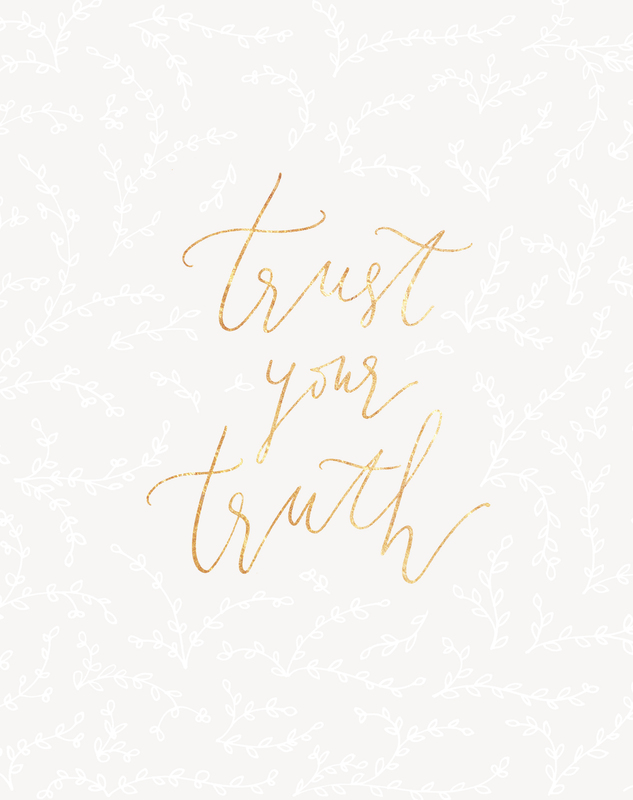 For me, “trust your truth” is all about accepting where I am at this point in my life and with my work — trusting that I am on the right path for me. It doesn’t look like anyone else’s path, but that’s okay. It is my truth and my path alone. Each of us has a different one — they shouldn’t all look the same! If I accept where I’m at, I can more easily move forward and grow.